Last night, Joc Pederson stroked two HRs and Kevin Pillar added another, bringing the total number of Jewish home runs this season to 106, led by Alex Bregman’s 30. According to statistical projection services cited by FanGraphs.com, the Jews of 2018 are likely to end the regular season with 112 to 114 HRs, just short of the record 115 set in 2016. But if Pederson stays hot, or Bregman catches fire, it’s possible the record could fall. The 2018 season already stands out. On June 8, five Jewish batters set a record by homering on the same day, with Ryan Braun hitting two. Five players have reached double-digits in home runs this season, and the only thing stopping Danny Valencia (9) from joining them was Baltimore’s decision to release him on August 15. Power at the plate has ebbed and flowed since Lip Pike became the first Jewish player to homer, in 1871, and Bregman smashed the 3,000th Jewish home run in 2016. As shown in the table below, there have been 49 seasons where Jewish players did not hit a single round-tripper. From 1986 to 1990, in fact, there was not a single Jewish at-bat. No Jewish player had hit even 10 HRs in a season until a Detroit Tigers rookie named Hank Greenberg stroked 12 in 1933. This helps explain why Jewish fans went so crazy over Greenberg, who went on to hit a then-N.L. record 58 home runs in 1938, two short of Babe Ruth’s then-Major League record of 60. In terms of home-run frequency, the greatest season in Jewish history was 1950, when Jewish players such as Al Rosen (37 HRs) and Sid Gordon (27 HRs) homered a total of once every 18.37 at-bats. 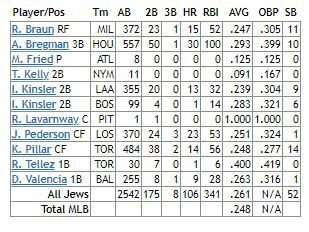 Through Monday’s games, the Jews of 2018 are homering once every 23.98 at-bats.